Chirashi Sushi (we call it Chirashizushi in Japan) is a type of sushi. 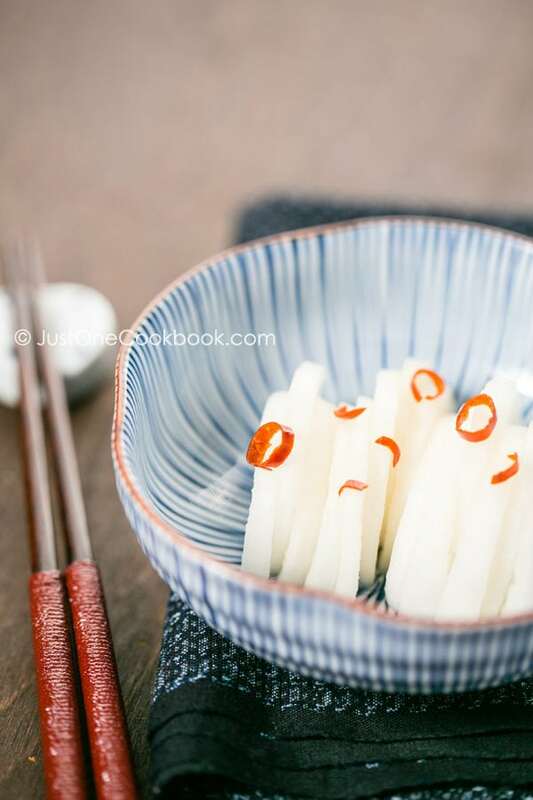 Although sushi is often misunderstood as just nigiri (a small block of rice topped with a piece of raw fish) or those interestingly named rolls in the US, there are actually many types of sushi in Japan. Among all types of sushi, Chirashi Sushi is probably the most commonly served sushi in Japanese homes. It literally means “scattered sushi”. Each region in Japan serves a slightly different version of Chirashi Sushi with different ingredients and toppings. In Osaka where my mom was originally from, it is also called barazushi or gomoku sushi. Sushi rice is mixed with unagi and cooked or uncooked vegetables. On the other hand, Edomae Style Chirashi Sushi (Edomae = Edo-style or old Tokyo style) is most common type of Chirashi Sushi served in Tokyo area and Japanese restaurants in the US, with assorted sashimi and colorful garnishes arranged beautifully on top of the sushi rice in a bowl. Chirashi Sushi is often cooked to celebrate special occasions, such as festivals and parties. It is also commonly eaten on March 3rd, when we celebrate an annual festival called The Doll Festival (Hinamatsuri). If you want to make everything from scratch, check out my Chirashi Sushi post. You have leftover Chirashi Sushi? Stuff Chirashi Sushi into inari-age to make Inari Sushi! Place warm cooked rice in a large bowl (I use hangiri, a wooden flat bowl, for sushi). 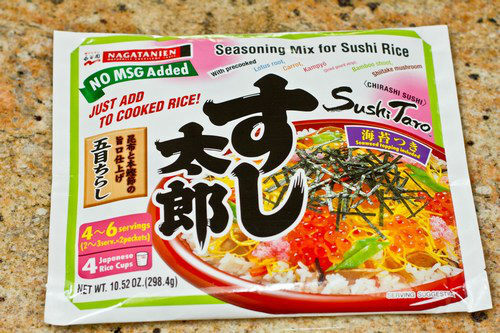 Add one packet of Chirashi Sushi Mix while the rice is hot. Fold everything together with the rice. Instead of “mixing”, you need to slice through rice using a rice paddle to separate the grains. Serve in a bowl or plate and garnish with Kinshi Tamago, ikura, and snow pea. You can put any topping you like, such as your favorite sashimi. Place shredded nori sheet on top right before you serve (otherwise it they will wilt quickly). 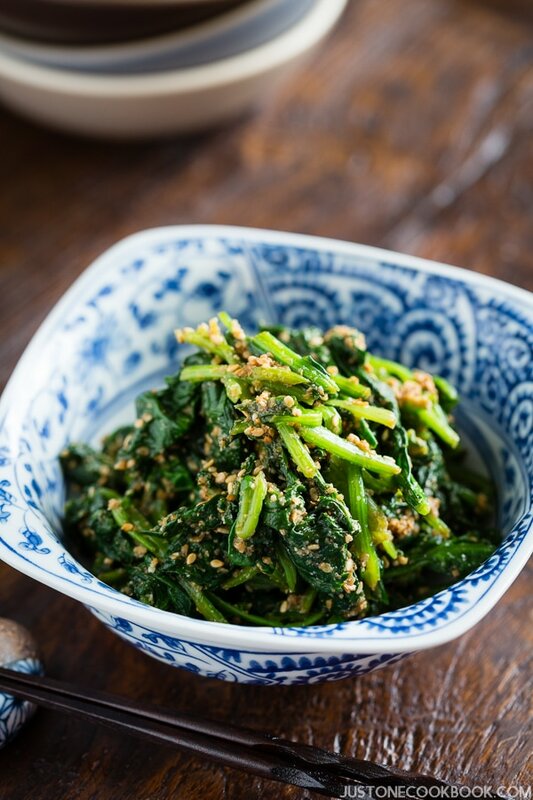 As always, I use pickled veges instead of fish – all set and ready to devour this recipe! Very pretty. Do you use fresh ikura? I only found frozen ones at the supermarket. Your sushi looks perfect and your pictures are as stunning as ever. Hmm – I would a bowl of that – looks so incredibly flavored! Nami, I didn’t realize that something like this chirashi sushi would also be considered sushi! I always learn so much from you. It looks absolutely gorgeous, and so much better than any fast food! Nami, this dish has one of the most beautiful colour combinations! I also see that the textures of the toppings would be very different and interesting. 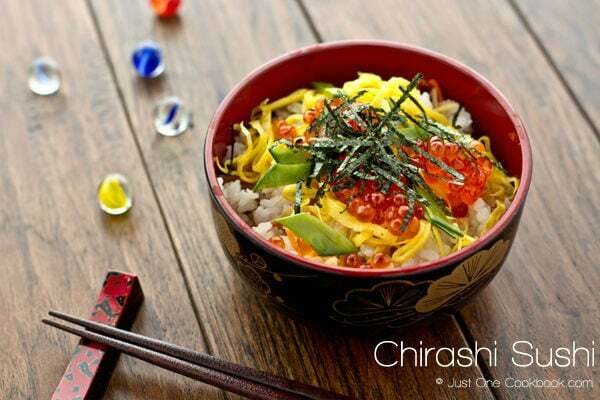 In short, chirashi sushi sounds like one more Japanese dish I would become hooked on. Thanks for giving us the leftover recipe too! It’s an excellent idea. What a beautiful dish, Nami! I always learn something when I read your blog. Wow. Learned something that this is also sushi. Now that’s what I call Fast Food, Nami! It looks full of interesting flavours and textures. Loving it – and enjoy the Doll’s festival. Wow that looks really good. Never seen sushi served like that before. Thank you for sharing this with us and opening our minds to different kinds of sushi and not the typical nigiri. I’ve never made this before but it’s nice to know there are some quick and delicious ways to prepare it. What type of flavors does the seasoning packet have? I wish I had you with me when shopping at the Asian Market. I could learn so much and be more creative in my kitchen and sushi class. I like the added garnish as well of the shredded nori, it makes for a nice presentation. Lovely interesting post. That is such a beautiful dish, Nami. A little work of art, and I adore the little clogs! Thanks for sharing another yummy sushi , this sound easy than normal block sushi. I planning to visit your mom staying place in June, hehehe.. I keep looking at your picture and then the picture on the package and they almost look identical. Almost. Your’s looks much better. Way to go Nami!!! Your chirashi sushi looks so gorgeous and it realy looks simple. time for me to check out if india has a japanese online shop, so hopefully I ll be able to make all your wonderful creations soon! thanks for sharing! Thank you for sharing, Chirashi Sushi looks absolutely beautiful! This is such a great idea! You know it isn’t my thing…but it looks beautiful! You are such an artist with food, Nami! That bowl of sushi is just gorgeous! Everyday we learn something, that’s great. Yes, I have in my mind that sushi is only the rice with the fish (nigiri). I never knew sushi can look like this too! Thanks to your wonderful blog I now know so much more about japanese cuisine! This is one of my favourites. I like the one topped with salmon sashimi as well as salmon roe. I hope they have that sushi mix in my Oriental shop. 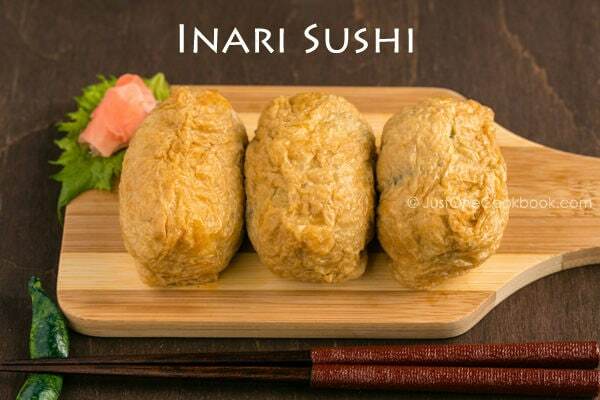 I’ve made inari-sushi numerous times and even posted the last one I did. They weren’t very impressive (no tobiko etc) as it was just the leftovers that I had thawed for a quick supper. That package of sushi mix is so popular here (we have a Don Quijote chain) but I’ve never tried it before. I’m a visual learner so thank you for the photos! Looks like we’ll be having this for Girl’s Day! i have always been more of a sashimi than nigiri gal, but never heard of Chirashi Sushi, love the instant package. I can’t believe your dish look just like the picture on the package!!! Well done! Love the little slippers. Are those chopstick holders? I love Chirashi Sushi! I didn’t know there are so many different kinds. The ones I’ve tried didn’t have the mixed vegetables in the rice. That sounds like a wonderful addition to the Chirashi Sushi and I know exactly where to get this package (lucky me! hehehe…) Your presentation is awesome. I’m always amazed at your artistic talents in arranging you food/dishes. You have a wonderful weekend too. I look forward to your guest post next week. This looks fantastic–I love the shredded nori garnish. Beautiful! And delicious too I bet. For sure much better than fast food! Absolutely stunning! Love the colors and flavors Nami! Beautiful photography! Wow – that’s stunning and your photos are SO beautiful! Nami, we always learn new Japanese foodie facts from you. I just love how it is all in a bowl. I would love to try sushi IN Japan, because I know it would be such a different experience than here in the US. Thanks for sharing, Nami! Really delicious looking dish, you made just like the one in the packet! eek, Nami, your pictures are so incredibly beautiful. I love the marbles and the geta in there, which highlights the extreme color explosion in your bowl of chirashi sushi!!!! I really wish I had it in front of me for real right now!! You are truly amazing Nami! Such a simple dish, but so beautiful. And gorgeous pictures Nami, I love the marbles….. Honestly I never had any idea about Chirasi Sushi, I learn so much here…. This sushi looks beautiful and delicious! I have had sushi only once in my life, few days back. Before that I was afraid of raw fish but once I tasted it I found out it’s awesome! I just love learning more and more about Japanese food. I never would have thought to call this sushi!! It’s a beautiful and colorful dish!! Oh Gosh Nami, I cant take my eyes off your pictures, they are Amazing! I love all your recipes, they are so easy to make if you have the ingredients. I loooove your cuisine! This is such a great idea Nami! Love how you made both meals..photos are OMG so yummy! You are always doing something incredible..
Sushi in a bowl! I love it. Very inspiring, Nami. Thank you for sharing your creative recipe and beautiful photos. It’s always a treat to stop by and see what you’re up to next! Sushi in a bowl sounds a lot easier to make! Love this, Nami! 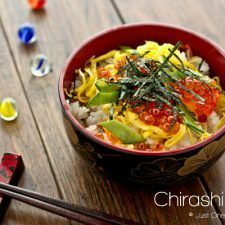 I love Chirashi sushi and you remind me that I haven’t made this for months – it’s high time to make it again :). I have never seen those instant Chirashi sushi mixes over here though, would love to try them! Looking forward to seeing your cute guest post :)! I love how colourful it looks! 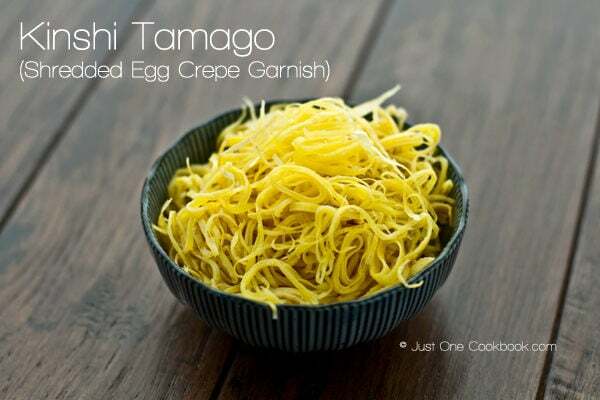 You always share such interesting recipe from Japan! This looks lovely and that prop you used .. those pair of sandal is so CUTE. 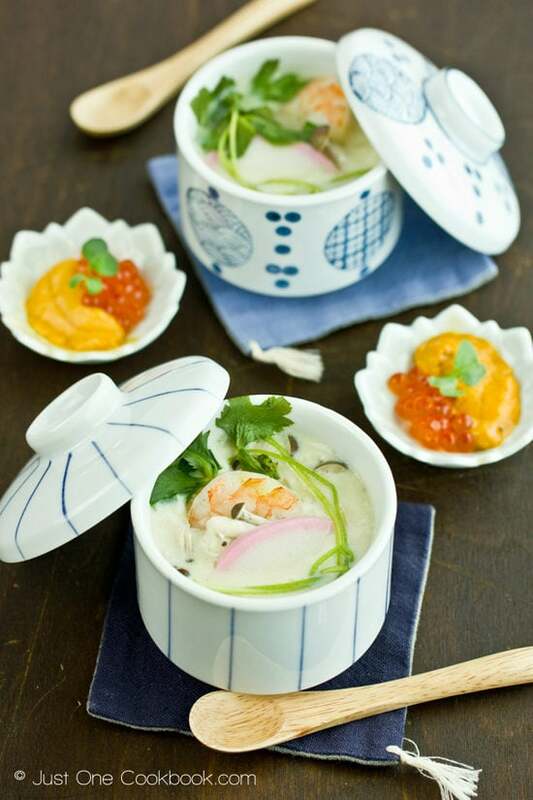 A great idea to introduce chirashi zushi to all as this is probably the ideal home-stye form of sushi! I like the idea of scattered sushi! Saves lots of time rolling and moulding. Yum! Ohhh Nami, I’d love to come over for dinner at your house, this looks so yummy!!! Nami this is so lovely. You sure know how to do gorgeous, vibrant food. I would to have lunch with you one day. wow! i never knew all this! thanks for sharing! I’m not normally keeping a sharp eye out for fish roe, but for whatever reason, your picture is causing me some serious enticement! I totally agree with the above comment as well. Your photos are absolutely stunning! Keep it coming! Gorgeous! I’ve never gotten to try chirashi sushi – most of the places around here serve the typical Americanized rolls. Which just means I’ll have to make it for myself – can’t wait. Your dish looks delicious and pretty as always! I LOVE that mini pair of Japanese slippers! haha I was one of them that always thought sushi is just a block of rice with toppings. It’s great to know that there are many different forms of sushi so I won’t embarrass myself in front of my Japanese friends. This recipe is easy to make and beautiful as usual! I think the cubed sashimi don I always love might actually be a chirashi sushi. This is my kind of meal. I don’t think I’ve seen chirashi sushi mix sold here, I can season the rice like making sushi rice with rice vinegar and sugar? 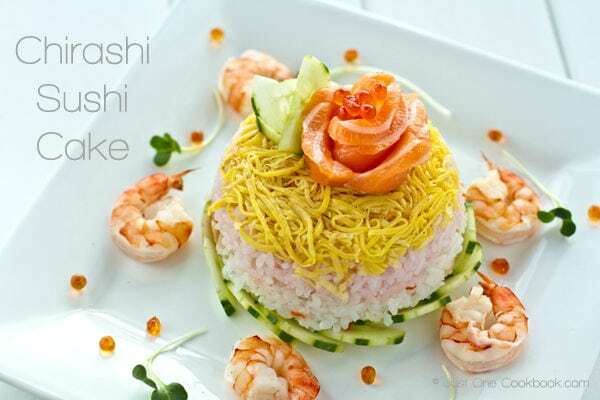 Nami, this is one of the truly prettiest dishes I have ever seen. Your photography is simply luminous. I’m happy to learn about Chirashi Sushi as I am one of those who has firmly embraced ‘California style’ sushi 😉 (I love the fresh veggies – avocado, carrot, etc.). Gorgeous presentation Nami. 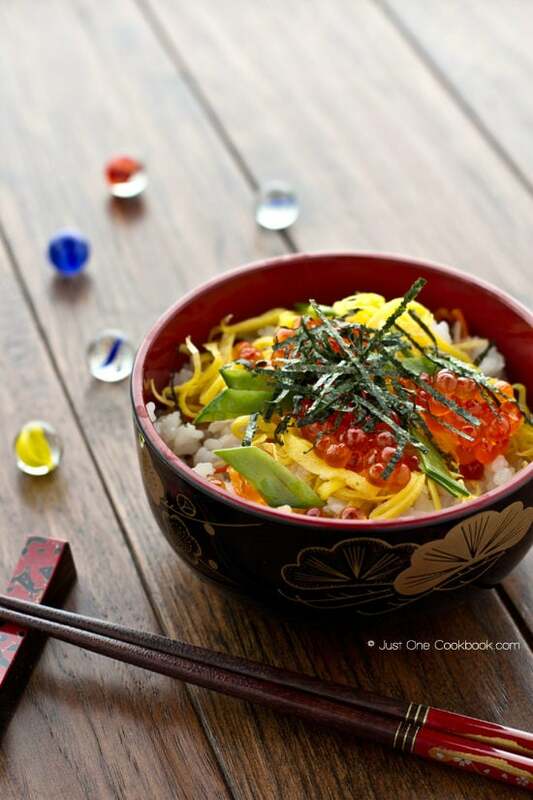 I love making chirashi at home for a quick and refreshing dinner treat. With the assortment of toppings, it’s like every mouthful is a different taste sensation. No wonder I never tire of eating this dish. Oh my goodness, I’m comment #90! Nami, this is such a favorite of my son. I must make this soon. My son, Toby (the one who loves Green Tea cake) always orders this when we eat out. Now I have a recipe to make for his dinner at home. Thanks for sharing. Have a good week! Nami this looks absolutely gorgeous! This has become our new family favorite and bumped sekihan from our repertoire! Thank you, Nami! We love chirashi, so fun to top it the way you like. Not sure if My daughter would go for the salmon roe, but I won’t know unless I try it. Who knew she would like nori and furikake on her steamed rice 🙂 I will look for the Chirashi Sushi Mix. I love coming to your blog and learning new things. I am lucky to have a very well stocked Asian market in the same shopping complex as my store, but no one there can help me when I have questions because of the language barrier. With your help I get small hints about what some of the products may be! This chirashi sounds wonderful. I’m so behind on your posts due to a bout with strep throat, but I’m having so much fun looking at the ones I missed. I LOVE these photos. Really nicely done with the marbles. 🙂 The sushi looks exquisite too. I always learn things here and now I know that I would like to try this “scattered” sushi. I’m always looking for a new twist! I love ikura! I miss having a good source for fresh since we moved from Japan. Thank you for your delicious blog! I look forward to seeing all the recipes. I LOVE Ikura! I use them when I make variations of Wafu pasta or Tarako pasta! Your Chirashi looks so delicious! You have a lovely blog as well! I am glad I found it! Cheers! Hi Nami. I chanced upon your blog while browsing for green tea suppliers, and what a find it is! Love your site and love the way your present your food. I will definitely try your recipes, hoping that I would be able to find the ingredients in this part of the world. Cheers! My mother is from Osaka, too! I was born in Tokyo. Since I loved chirashi, she’d make it for me as a treat when I was a kid, especially if I was home sick and couldn’t go to school. Great memories! I happened to find your blog a couple days ago searching for “Japanese Food Blogs”. It came up first. I signed up for your newsletter and am thinking of getting your recipe book. My stepson is getting married this summer and we are having a kitchen shower for them in a couple weeks. His fiancée taught in Japan for 2 years, so we are having a Japanese theme. I was asked to make chicken teriyaki and I think they are expecting an American version with stir fried vegetables. I plan on using your recipe, but after it is cooked, would it be alright to remove the skin as I know the other ladies don’t want the skin on? I am also just going to prepare rice and steamed broccoli. I called a Japanese market here in Houston where I live and was asking him about certain ingredients and 1 pot dishes and he mentioned chirashizushi. I have researched so many recipes and they sound so time consuming with all these weird vegetables to add to the rice and so time consuming. I came back to your blog and found this simplified version with the mix containing all the veggies. I am now thinking about making this for a group of 20-25. I understand you serve the dish at room temperature, so can I make the rice the night before and add the veggies to it and then pull it from the fridge next morning, letting it come to room temperature and then adding the other topping ingredients. We will be serving it at lunch. I am not certain of the fish eggs, as I am not fond of them, but want other people to enjoy them if that is their thing! Maybe it is more of a texture thing with me, lol! !During my all day affair with my computer searching for Japanese recipes, I wondered if I could add some other things pulling from different recipes such as some cooked shrimp. I understand you can really add however many and whatever toppings you want. I will not be using any raw fish as it will become to expensive and not sure there will be many people liking raw fish. Also, I notice in other recipes from scratch, after cooking rice you turn it into sushi rice with vinegar, mirin, etc. then add the other vegetables that you would be buying individually, The vegetables included in this package are the same. I pulled up the contents of this package and it looks like all the ingredients for turning the rice into sushi rice are also included in this package and you didn’t mention adding them in addition to the package, so I assume all I use is the package? Please correct me if I am mistaken. I cook a lot of international food, but have never tried my hand at Japanese. We are getting a decorated cake, but I also want to try and make your cherry blossom cookies. So perfect for our theme. Can you recommend anything else that might be easy to fix and go with the chicken teriyaki? I hope you see this soon and I hear back from you. As I said the shower will be in a couple weeks. Sorry for such a long comment and not checking for spelling mistakes, so excuse any I might have. Thank you so much for all your help. And congratulations on your step-son’s wedding! Since it’s a long comment, I’m going to answer one by one. 2) Chirashizushi is a very traditional food, so I know, there are a lot of unique, not so common (but common in Japan) ingredients in there. Considering the number of guests, I think it’s wise to buy chirashizushi packs and make it. 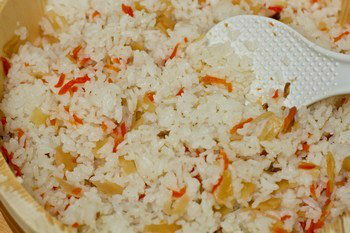 3) You could prepare the rice ahead of time. However, please remember that rice do gets hard in the fridge. My trick is wrap the bowl/container/plate with plastic wrap and then wrap the entire thing with kitchen towel or something so that rice will not get too cold. Towel is like a buffer. It “helps” but it’s not like rice that you freshly made. 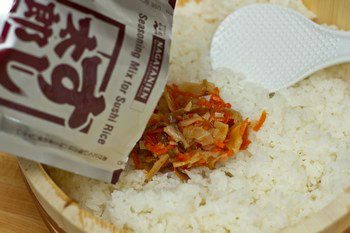 4) You can mix the rice with package already, instead of mixing in the morning. You can save time, if you are making rice ahead of time anyway. 5) Chirashizushi doesn’t always have raw fish on top – unless it’s a really fancy version. You can boil shrimp and slice it in half (so both side has red color when you decorate). Try to make chirashizushi pretty with colors – egg (yellow), shrimp (red), and snow peas (green). Maybe these images may help? 6) Yes, the package is including the sushi vinegar. Just mix and ready to use (except for toppings). It’s really hard to suggest what type of dishes you’re looking for…. Thank you so much for getting back with me. I really appreciate it I have spent the afternoon reading more recipes on you blog. 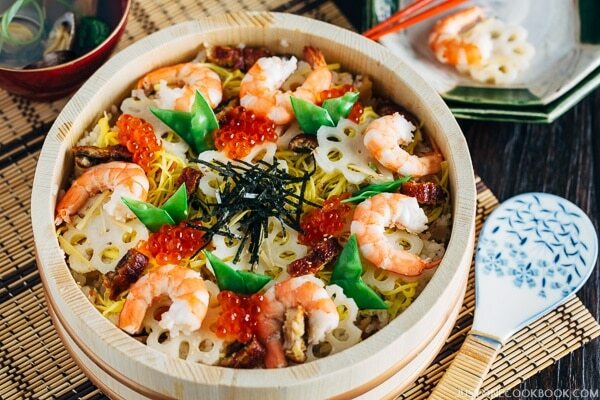 I love the idea of the Yakisoba and then reading another reader’s comment about her preference for yaki udon…..that has me intrigued. Of course, it all depends on what I can find at the Japanese market here. Which of these two do you prefer or which one do you think is more flavorful? I know they both must be good, but I don’t really know the difference in the sauces, only that you use a different type noodle. I assume you can add whatever veggies to either one? Would steamed broccoli thrown in at the end be an ok veggie to add along with the others? I love your suggestion for the honey-soy sauce chicken, but I know we want to keep the chicken off the bone, so I would probably do the chicken teriyaki instead. I would have to prepare the chicken teriyaki the night before, therefore it wouldn’t be impossible to follow your recipe and then I would just have to reheat the next day. Whatever I do, I need to do the night before, so if I chose to do yakisoba or yaki udon, could I prepare everything the night before except for the noodles and then the next day heat it up and add the noodles fresh at that time? If I do the chirashizushi,, I could probably wait and do it the morning of. I have a rice cooker, so it really wouldn’t take too long and maybe have everything else chopped up the night before, then when the rice is cool, throw it together before I leave for the luncheon.. I was also intrigued by your recipe for Korokke, but I know I couldn’t deep fry them ahead of time. I wont have that much time and I have to travel an hour to the luncheon and be there early before it starts. Have you ever baked them in the oven instead? I really would like to do these but just can’t with the deep frying method. What do you think? I will probably do the chirashizushi along with either the chicken teriyaki or one of the noodle dishes. and maybe the korokke if it would work for me to bake in the oven. I can spritz it will oil of some kind for baking in the oven. Thanks again for all your help. I feel like I have found a goldmine here and am anxious to try my hand at Japanese cooking!!! Yaki Udon and Yakisoba have different texture and different flavor. To cook ahead of time, I think Yakisoba will stay better than Udon I think. If you have a griddle over stove, it’s much easier to cook as well. We don’t usually put broccoli in there (florets going to be broken and it can be messy), but if you want to add steamed broccoli toward the end, it should be okay. Never had it with yakisoba so I’m not sure how the taste would be. 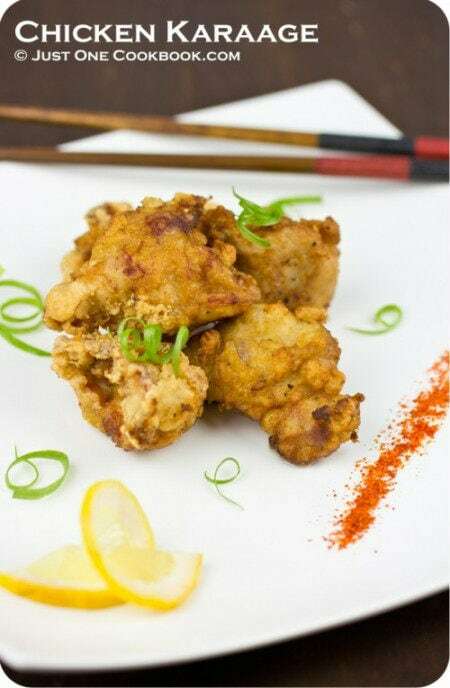 You can use chicken thigh or breast for honey soy sauce chicken too. I do have baked korokke recipe! Thank you so much Nami for all your help. I will definitely try the baked version of korokke and will try some of the other recipes before the luncheon and then decide from there. I will let you now how everything turns out. Can’t wait to taste these!!! Thanks Nami for all your help and suggestions. I will definitely try the baked Korokke. I will try some of the other recipes ahead of time and then decide which I will fix for the luncheon.. Can’t wait. I will let you know how everything turns out. Nami, Is Charashi Sushi equal to Poki’ Bowl….Our local Nanlanka Japanese Rest. 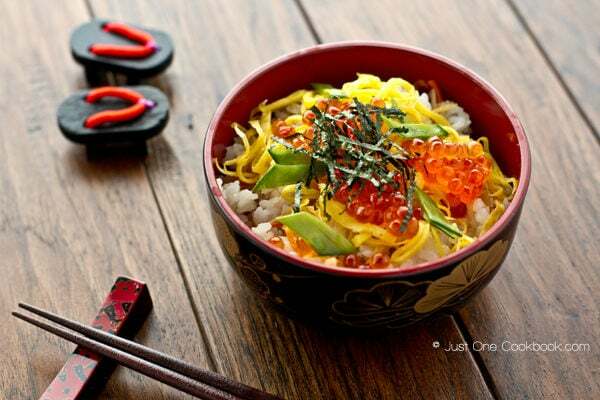 has a Poki’ Bowl to die for…Have to have my fix once a week…Thank You for wonderful Newsletter. If I have leftovers, can I use it the next morning in ochazuke?